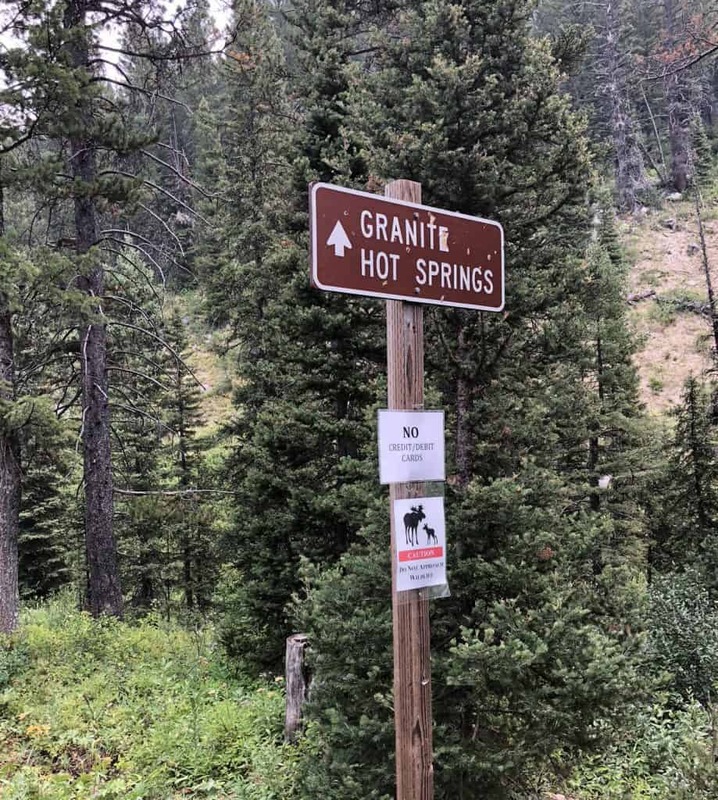 Let me tell you everything you need to know before going to the beautiful Granite Hot Springs! Don’t forget to check out the amazing waterfall on the way in/out! Now that you “Know Before You Go” I hope you enjoy your experience at the hot springs! If you’re visiting Jackson, Wyoming with kids, check out these other articles! Granite Hot Springs is one of our favorite places to camp, as well as enjoy with our kids! The water isn’t too hot, and is contained in a man made pool. This means no currents or rocky areas to worry about with the littles! Not only is the water amazing, but the scenery is beautiful! There are trees behind you, and the walk to the hot spring itself is beautiful! If you plan on camping, there tons of sites to choose from! While there is an established campground, the “primitive camps” that are on the way to the hot springs are spacious and extremely private. 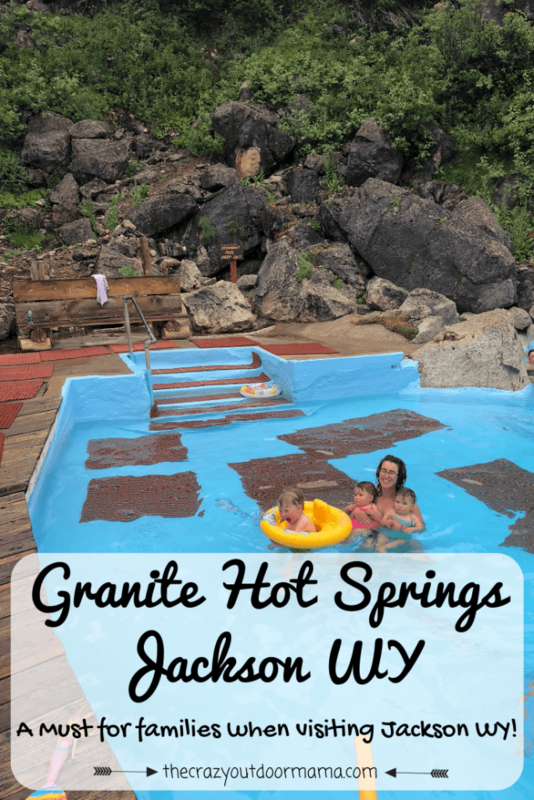 Granite Hot Springs is a local favorite, and a must see if you are staying in Jackson! Related: Don’t forget to check out Grand Teton National PArk nearby – here are the 6 most beautiful hikes that anyone can do in Grand Teton National Park! I want to give you a few tips about this beautiful spot so that you can enjoy it too! Turn at the marked dirt road, and you’ll drive for around 9 miles to the hot springs. While it is bumpy, it’s a beautiful drive! In one area, you can see the clear water of Granite Creek coming together with the typically Muddy Waters of the Hoback Canon – it look’s awesome! During winter, you can only get to granite by skiing, snowmobiling, dog sled or fat bike. There are a ton of sites (51!) but they are first come first serve. Obviously, the weekends are busiest, so plan to come early! There are no hook ups, but basics like drink water, a fire pit, picnic table and some vault toilets are provided. 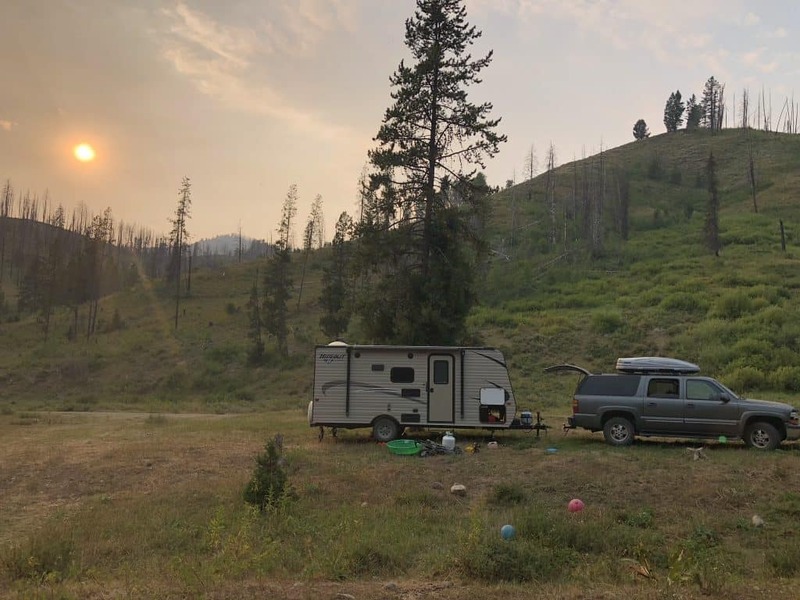 The fee is 15.00, but if you can’t find a spot I DEFINITELY recommend finding somewhere free to camp along the way to the hot springs! There are quite a few “primitive” camp sites off the side of the road that are way more private and awesome, and best of all, free! Some of them are a little gnarly to get into, so just be aware of that if you have a low riding RV or camper like we do. This campground was on the way to granite hot springs, and was way roomier than the actual campground! We always opt to camp this way! We have brought all our 3 under 3 in the pool, and they love it! In summer it isn’t as hot due to snow melt off, so it’s mild enough for any age child. FYI, the temperature is much cooler at the start of the season (some says it’s not even “warm” and are quite disappointed) and hovers between 90 and 94 degrees most of the summer. There is a spot where the water comes in that is a lot warmer, but it’s a super small area that is often full of people anyways. 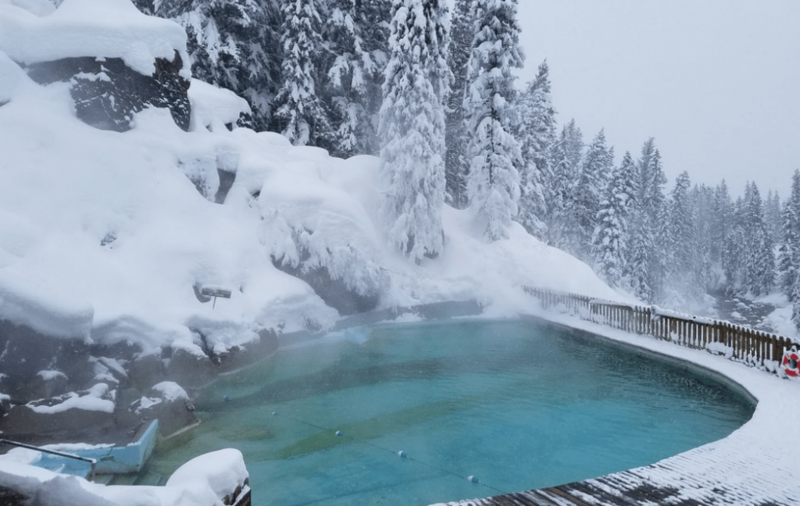 While I haven’t been to Granite Hot Springs during winter, this looks amazing! This was possibly the best part, especially if hot springs during a hot summer aren’t your thing. There is a short (though somewhat steep) trail to the nearby waterfall, and you can literally walk right in front of it! 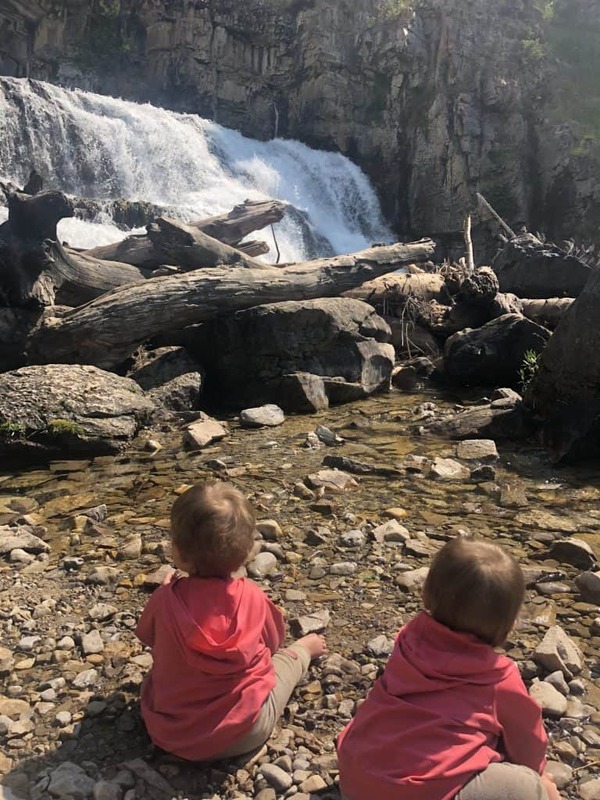 A build up of logs and rocks at the bottom of the waterfall created an amazing spot to enjoy mist, and slowed the water so that babies and toddlers can splash around! The waterfall that is on the way to granite hot springs was stunning. It was a great place to let the kids out to splash and play, and the mist cools you off on hot summer days! I definitely needed this cool off after a weekend of camping in the middle of summer! Keep in mind, this beautiful spot is in the MOUNTAINS that was built in the 1930s! That means a lot of things are limited, including food and phone service. I love it though because it’s a great way to disconnect! I know, kind of a bummer.. but honestly, it’s just a good idea to carry cash while traveling. I know they probably get tired of telling people cash only… but people don’t really carry cash anymore! This is especially nice during the start and end of the season so that you don’t have to walk to your car wet! It’s also important to know that there are no towels or floaties available or for sale here! 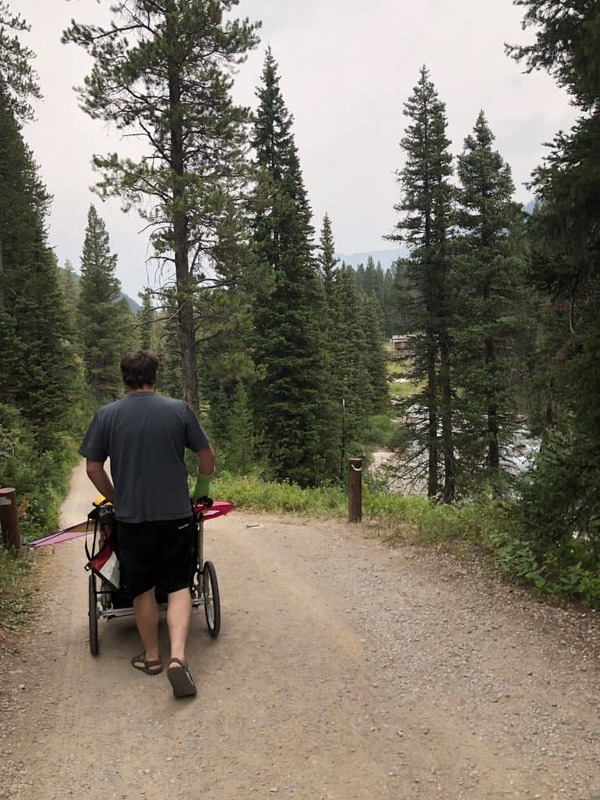 Bring everything you need, and if you have kids or a lot of stuff, consider a small stroller as the walk from parking to the hot springs is a little bit long with tons of things! These guys could make a killing selling some food here, but unfortunately, that’s not the case! You may not even get service till you hit the Hoback Junction, so make sure to text or call everyone you need to before you get there! This pool was built in the 1930s, so expect some very basic buildings and amenities! Even though a beer would be amazing, they are quite strict about having no alcoholic beverages in the pool. Let me know of any tips I missed! 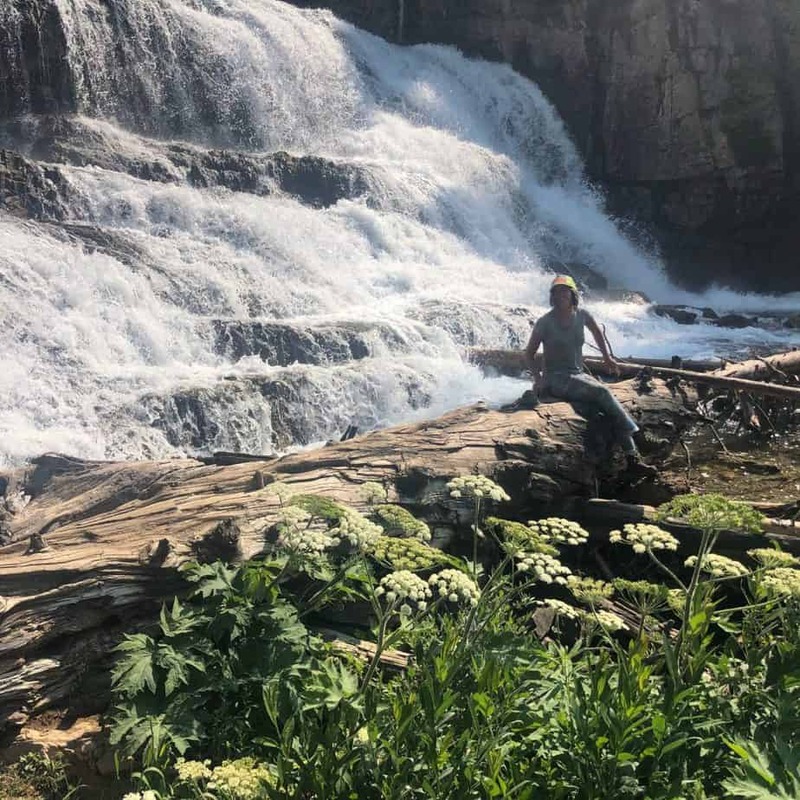 I hope you enjoy all aspects of this beautiful area – from the waterfalls, the camping, and the views all along the drive! P.S. If you’re looking for more beautiful spots in the area, you have got to see the beautiful String Lake in Grand Teton National Park! Check out EVERYTHING you need to know here! The walk from the parking lot to the hot springs is enough to bring a stroller if you have a ton of things. But it is BEAUTIFUL! Headed to Grand Teton National Park and up for a challenge (but BIG reward?) Check out this amazing hike to Amphitheater Lake! If you visit Jackson on your way out, check out the best 15 things to do with kids in Jackson Hole! If you want to soak in some natural fed hot springs after a big day of hiking in Grand Teton National Park, then you have to visit Granite Hot Springs! Check out 15 awesome things to do in Jackson, Wyoming (the town right near the hot springs)! Great article, very helpful, plan to visit !! !